It is impossible to underestimate how embarrassing this doping bombshell is for Sheikh Mohammed, Godolphin's owner, who is also the ruler of Dubai and prime minister of the United Arab Emirates. OK, trainer Mahmood Al Zarooni has accepted responsibility for the fact that 11 horses from the stable - including unbeaten Certify and Gold Cup runner-up Opinion Poll - have tested positive for anabolic steroids, with a slightly lame explanation that he didn't realise he was doing anything wrong because the horses were not in competition. Who is Mahmood Al Zarooni? And the Rules of Racing do specifically make the trainer responsible for what happens to their horses in cases like this, so it is he who will take the expected hefty rap. But this stable is like no other, in that the hands-on approach adopted by the Sheikh - known as 'the Boss' - is legendary. It is constantly emphasised how few decisions, from numerous horse purchases to race strategy and tactics, are made without reference to him, wherever he may be. Indeed, the very fact that most Godolphin horses spend their winters in Dubai is partly down to his much-discussed desire to juggle seeing them with governmental matters. And Dubai's reputation as one of the world's great leisure capitals has been built on the publicity generated by the success of Godolphin and its sporting owner. There is no suggestion at all that Sheikh Mohammed, who was described as being "absolutely appalled" by the failed tests, has done anything wrong. Yet this all seems to have unfolded pretty much right under his nose and under those of the large retinue of professionals and advisers which oversee the operation. So doubts are sure to arise as to just how well Godolphin is being run. 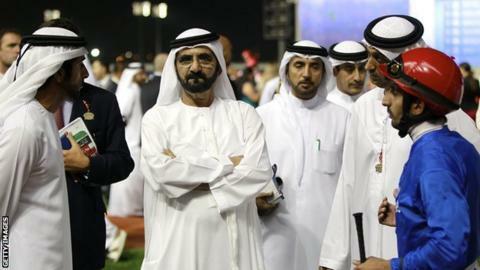 In 2009, a horse owned and ridden by Sheikh Mohammed in an endurance race in the Gulf failed a drugs test. But that aside, the Sheikh has been a high profile opponent of drug abuse in racing, with a representative in the US resigning from the Breeders Cup organisation over the decision not to ban anti-bleeding drug Lasix. Al Zarooni, 37, was appointed in 2010, and has proved quite a hit in winning the Dubai World Cup, the world's richest race, and a string of top prizes across Europe for Godolphin. But the one shadow cast across an otherwise successful CV was a previous breach of the drugs rules, when he was fined £2,000 over the use of a banned pain reliever on two horses in August 2012. Although by no means as serious as this case, in terms of substance, it was enough to make his stable liable to spot checks. As though that threat wasn't mortifying enough for the biggest, most expensively assembled racing stable in the world, for a surprise visit to find a quarter of the horses tested were positive is completely mortifying. And for the illegal substances discovered to be types of that most outlawed of performance-enhancing drugs, anabolic steroids, just adds to the pile of woes. Away from this news, that pile includes sometimes indifferent form- the word "under-achievers" is regularly bandied around- and the poor handling of the departure of Frankie Dettori as number one jockey. Ironically, Dettori subsequently received a six-month ban himself after testing positive for a never-specified banned substance, though it was not performance-enhancing. We must now await a British Horseracing Authority disciplinary hearing into the Al Zarooni case, and the results of "an urgent review of all our procedures and controls" by Godolphin. Sheikh Mohammed and the Godolphin stable will doubtless weather this storm, with probably one or two casualties amongst the workforce. But it is debatable if their reputations can ever be quite the same again.